Seaweed baths are popular in Ireland, but are not a recent phenomenon as many date from Edwardian times, when they were more widespread than they are now. There were baths in most large seaside town such as Salthill, Co. Galway, and Howth, Co. Dublin. Essentially, seaweed baths are ordinary baths (usually for one person in a private room) filled with hot seawater and seaweed, generally wracks such as Fucus serratus. The wrack is generally steam-treated prior to use so that it releases minerals, trace elements, and polysaccharides such as alginates. Many people swear by the efficacy of seaweed baths in the treatment of rheumatism and arthritis. Writing in the Irish Sunday Tribune on 28 May 2006 of the 50 things he most liked about Ireland, Geoff Wallis, co-author of The Rough Guide to Ireland, eulogised: "They look loathsome and can smell hideous, but nothing's as relaxing as a deep oily soak (and the smell disappears after a subsequent cold shower). The best are in Enniscrone and Strandhill (Co. Sligo)." 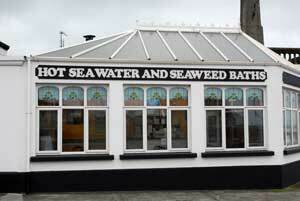 The hot seawater and seaweed are replaced for each customer and the baths are thoroughly cleaned. Strandhill, Co. Sligo, is at the end of a small peninsula south of Sligo Town; it is a wonderful area to visit, with an astonishing array of prehistoric tombs, some amongst the largest and best-preserved in Europe. A manageable climb of Knocknarea, is essential to see Misgaun Maeve, a cairn built about 3000 BC. Voya Seaweed Baths (above) is situated at the seafront at Strandhill, Co. Sligo, right beside a long curving beach, which you can walk after your seaweed bath. "Imagine relaxing back into a big bath full of hot seawater and seaweed. The heat releases all the seaweed's rich, silky essential oils so your body feels smooth, buoyant and luxurious. 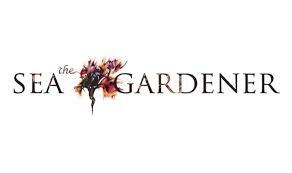 Tiredness, tension, aches and pains slip away. Feel your eyes close and your whole body sigh with sensuous satisfaction. One of life's simple pleasures. Take the plunge, you deserve it!" Enniscrone is a seaside village north of Ballina. Kilcullen's Seaweed Baths (right) is also well situated on the eastern end of the seafront, and again there is a beautiful sandy beach for your post-seaweed-bath walk. "The beautiful Edwardian fittings, comprising the original enormous glazed porcelain baths, solid brass taps and panelled wooden shower cisterns, which a decade ago might have been considered dowdy, now combine to provide the unique ambience of the Bath House." 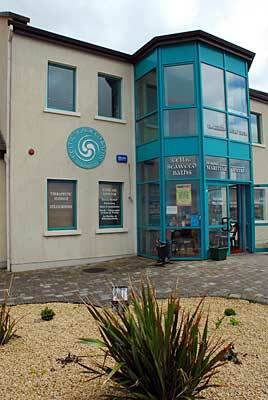 There are also seaweed baths in Ballybunnion, Co. Kerry. Collins’s Hot Seaweed Baths has remained in one family for three generations and is now run by Mary and Seamus Collins and their daughter Clare. Site © M.D. Guiry 2000 - 2019. Important copyright notice: all text, design and photographs on this site are copyrighted by M.D. Guiry unless otherwise stated and all rights are strictly reserved. Click here for copyright information and contact. Website design: 249 Design Studio. Site maintained by M.D. Guiry (michael.guiry@nuigalway.ie). There have been 8709165 page loads since 1 January 2014 on 19 April 2019.